Gooooood morning internet! I'm strangely in a good mood today considering I have to go to the DMV to have my drivers license renewed. It's going to take hours! Hopefully I'll get a good photo. Haha! Day 4 of the 31 day challenge is Green. I spent a lot of time trying to think of some green nails to do, but nothing was really coming to me. So I started going through a folder on my computer of inspiration images I had saved ages ago, from before I started blogging. I found an old manicure that I used to be obsessed with, so I decided it was time to recreate it! Tada! Green mis-matched skittles! See the inspiration photo in the background? I took the photo in front of my laptop screen. Heh. I have no idea where this nail design came from originally but you can see the original photo here. If you know who this belongs to, please tell me so I can properly credit them! The green polish in this manicure is China Glaze - Entourage. Entourage is from the Kicks collection, which had some totally awesome shades. However, this one stains like a bish. OMG, I wore it for less than a day and my nails are so yellow. I won't be wearing this on its own again... Bleh! The gray polish I used is China Glaze - Recycle. I thought this polish was fitting to use because as I was brainstorming green nails, my mom suggested I think of green as environmentally friendly and do recycling nails. Recycling? Nah. Recycle? Yes! Color Club - Where's The Soiree? and French Tip were my black and white polishes of choice for this manicure. Look how bad the Recycle shrank!! I guess I had too many layers on that nail that I didn't let dry enough before adding topcoat. There was 3 layers of green, then white, and then gray on that corner. Whoops. I hate shrinkage! Good thing it doesn't happen to me too often. Something else stupid happened while I was wearing my green nails... I broke one. Day 4 of the challenge and I'm down to super shorties. Sigh. Just my luck! Oh well, I'll rock the nubs. The checkered tiles were glued on so intensely, it's a miracle I only broke one nail. I loved my red-and-checkered room but it just got a little old and felt kinda heavy. I already have my blue nails for tomorrow done, and I am super pumped about them. Be sure to come check them out! that's so funny.. the other day a friend of mine sent me this picture wanting me to do this manicure for her! So cute!! Can't wait to see how your room turns out. Love the nails. They look awesome! The nails look great Rebecca! Very cute and I always love mixed up manis! I love this mani, it's so cute! Can't wait to see what you do with your room! This looks great, but I'm excited for your room now! I love the way the green grey and black look together! I also really like the mix of animal prints - nicely done! 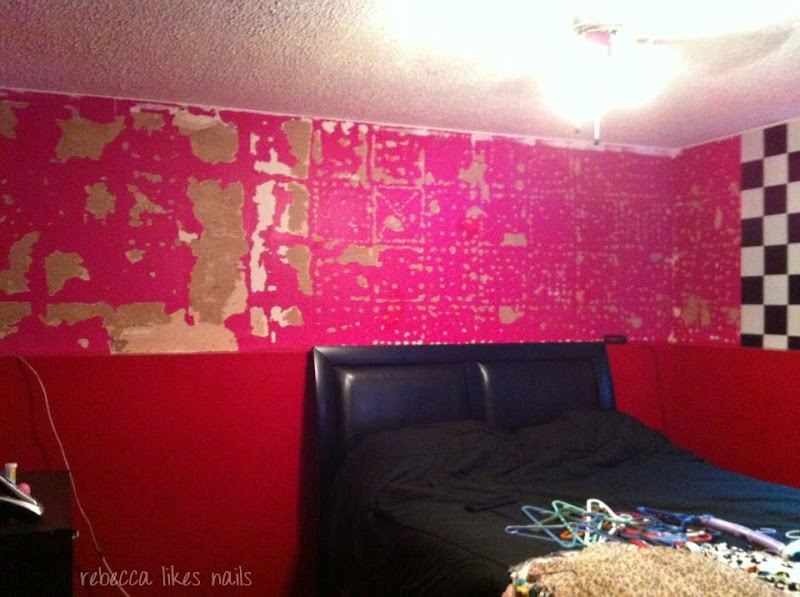 nice mani :) i like your room! I really like this mani ! The colors combo is simply awesome !